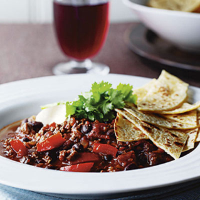 This chilli dish, which uses black beans instead of kidney beans, is ideal for a warming winter supper, served with toasted corn tortillas. Place the onion and ground beef in a large pan and dry fry, stirring occasionally to break up the mince, until all the meat is browned. Add the red pepper and cook for a further 1-2 minutes. Just before serving, heat a large dry frying pan until hot, and lightly toast the tortillas for 1-2 minutes on each side. Let them cool slightly then cut into strips. Spoon the chilli into bowls and serve with a dollop of crème fraîche, a few sprigs of coriander and the toasted tortilla strips. For a more traditional chilli, replace the black beans with a can of kidney beans.